This whole process can take less than 10 minutes if you are using a chained certificate. This step-by-step document assumes you are using GoDaddy.com. I use them because I can a secured domain for about $15/year—perfect for creating my web empire. 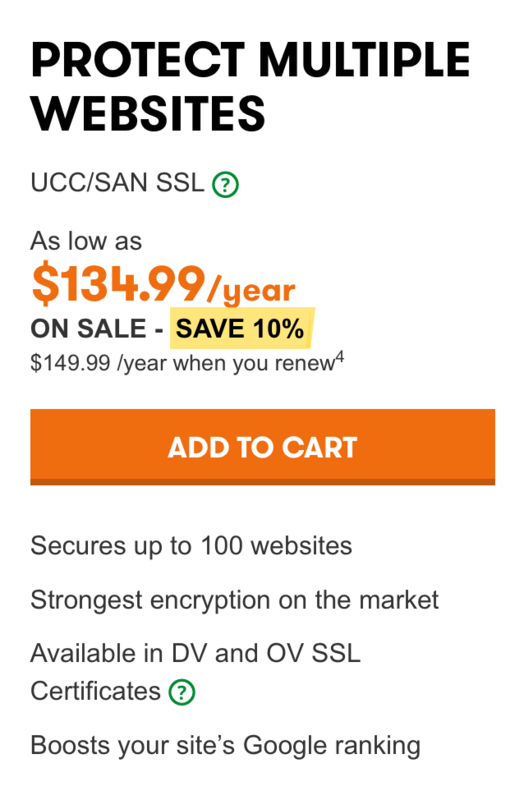 GoDaddy is consistently offering online cupons for as much as 35% off, which really makes a big difference when you are spending a couple of hundred dollars on a multi-pack SSL. Google "godaddy coupons" and don't give up until you find one. A Unified Communications Certificate (UCC) is an SSL that secures multiple domain names as well as multiple host names within a domain name. A UCC SSL lets you secure a primary domain name and up to 99 additional Subject Alternative Names (SANs) with a single SSL. For example you can use a UCC to protect www.domains1.com, www.domains2.net and www.domains3.org. Go to GoDaddy's SSL page. This URL may change. If it does, go to their main home page and look for the SSL options. Look for the option to protect multiple websites (UCC). See the image on the right. Choose the number of sites to protect. Here you want to estimate how many secure sites you will be creating for your web empire in the next 12 months. The more you choose, the cheaper it is per domain. Choose type of SSL. Standard SSL should be fine for virtually all needs. Follow the GoDaddy.com instructions for installing the main SSL and securing your first domain. The rest of this document covers how to set up additional domains after your first one. For the first domain, after you follow the GoDaddy instructions, pick up at step 5 to attach the domain to the DoWellWebTools tool. Scroll down to SSL Certificates and click. Click the "Manage" button by your UCC domain. Click the manage gear large button. Click "Add Subject Alternative Name"
Enter in your new domain name with the subdomain (usually "www"). For example, "www.mydomain.com". Save. When you get the e-mail confirmation from GoDaddy, click the link in the e-mail. This will take you to a web page where you are asked to click an "Approve" button. Click it. Now wait a few minutes for the "Your SSL Certificate Has Been Issued" e-mail from GoDaddy. Download the certificate as per the detailed instructions sent in the e-mail by GoDaddy. Once this file is updated, we restart the web server. Now you need to update the DNS settings so the registrar (in our case, GoDaddy) knows where to point the domain. Click the edit icon. Then change the IP address for the @ A record to the public IP address of the domain (the same IP as the master domain for the certificate). Be sure to Save and Confirm Save. At this point, the domain should immediatly start pointing to the server.